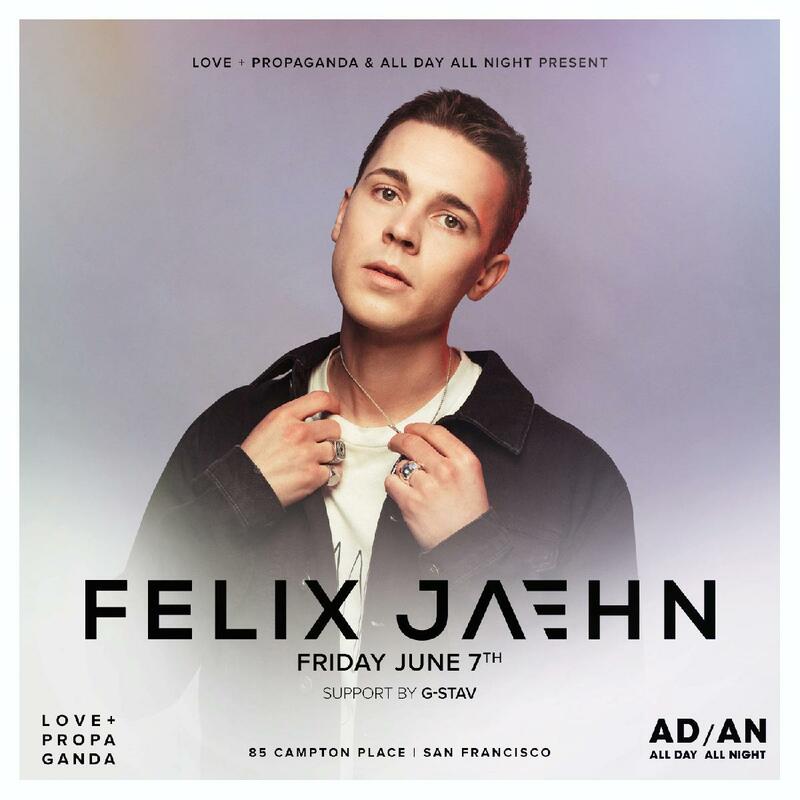 Ever since reaching the #1 spot in more than 55 countries with his rework of Omi’s 'Cheerleader', German platinum-selling DJ and producer Felix Jaehn has gained international success. 'Cheerleader', an undeniably catchy, reggae- infused dance hit, topped the charts around the globe including the Billboard Hot 100 in the United States. Jaehn's massive breakout single with vocalist Jasmine Thompson, 'Ain’t Nobody (Loves Me Better)'‚ became a worldwide sensation in 2015, officially establishing him as a fully-fledged superstar, touted by Rolling Stone as an 'exploding producer'. A naturally gifted producer from the Baltic Sea Coast, Felix Jaehn is now a household name, achieving global stardom with his unique productions. Having made a name for himself over the years, his collaborations speak for themselves, working with Steve Aoki and Adam Lambert on 'Can’t Go Home', and ALMA on 'Bonfire'. To date, Jaehn’s collective catalogue has been streamed over 1.5 billion times, and he has been awarded a total of 15 gold and 60 platinum records, receiving the 'Entertainment' award at the highly prestigious Berlin Bambi Awards in 2016. With some of the biggest crossover hits of the last few years, Jaehn released his debut studio album 'I' in February of 2018. The 25-track album was crafted with a deeply personal touch, highlighting his progress since 2014 and emphasising his journey. With the help of his team, Jaehn boldly stepped out of his comfort zone in the pursuit of continued sonic innovation, and produced a unique, career encompassing record. While each of the tracks encompass a unique sound, they all tie together with an overlying positive and energetic vibe, resulting in a sound not only tailored to radio, but also perfect for the clubs. Following the wildly successful release of his debut album 'I', Felix Jaehn has returned with a remix album that includes reworked versions of some of his greatest hits to date, including collaborative tracks with Marc E. Bassy and Gucci Mane, R. City and Lost Frequencies to name a few. With new music scheduled for August 2018, Jaehn is forging into the second half of the year with a steady stream of content, closing out the summer festival season in style.